Leave a lasting impression of your event with our Freeform Greeters. Welcome! Bienvenidos! Karibu! Velkomm! Aloha! Sva-gat! Bienvenue! Vítáme te! Welkom! Li Ho! Kalós orísate! Whatever the language, how you welcome your guests is key to elevating ordinary events to extra extraordinary experiences. Leave a lasting impression of your event with our Freeform Greeters. 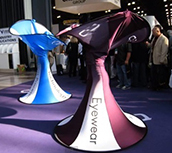 Also known as Spiral Divas, they can be positioned at event entrances to welcome your guests or placed throughout the cocktail area. Our performers will keep your guests amused! In our language, which translates with a flair for the dramatic and a dash of the comedic, watch how these sculptured theatrical greeters morph gracefully into art in motion. We offer this special service for a variety of events like trade shows, corporate meetings, awards ceremonies, product releases, galas and cocktail parties. Also, we can create a live marketing session with your digitally printed logos and images. Our Spiral Divas are a creative way of disseminating promotional materials and party favors. Our Freeform Greeters will keep your guests in awe and fascinated with ambient talent scattered throughout the entire event to make every moment a revelation. They will have your guests thinking about the fun they had after they leave. We live for the “oooh and aaah” moments so we are constantly sourcing new ideas and stunning performers to create that real wow factor for your event. We can provide beautiful costuming and diverse entertainers from around the world. If you have an idea, call us. Allow us to create a unique, exciting, and memorable show for you and allow our performers to do what they do the best, Eventertain!